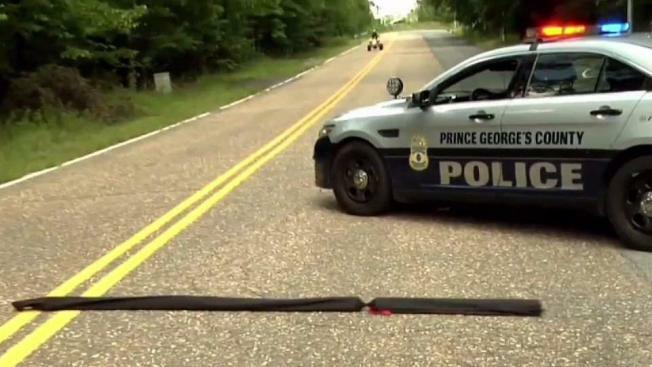 Prince George's County, Maryland, police will use a tire deflating tool that stops people who drive ATVs and dirt bikes illegally on public roads. The department said it will deploy stop sticks during the Labor Day weekend. The device is a series of short poles that officers can toss in the road ahead of a dirt bike. The poles contain sharp inserts that flatten tires gradually, reducing the possibility of a major crash. Authorities said the device will safely deflate the tires and force those driving ATVs illegally on highways and public roads to stop. Such drivers typically ignore commands to pull over. Polilce said swarms of off-road vehicles have choked streets in downtown D.C., the National Harbor and other parts of the area, endangering motorists and pedestrians.